Electrify the darkest nights and keep your event shining bright. 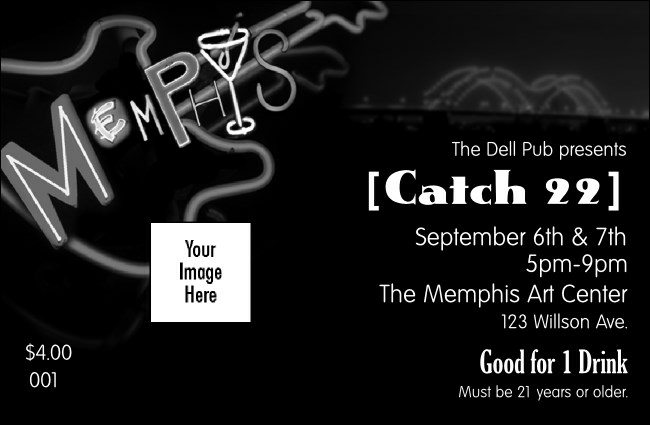 Let the Memphis BW Drink Ticket add a little refreshment to your next event. Economical black and white ticket helps you sell more drinks. Got a bar guarantee? Sell drinks in advance while you help out your bartenders. Or reward your VIPs with free drinks. Tie up those loose ends with the right Event Kit from TicketPrinting.com.